Before this year's Mises University, I had promised myself not to buy any books in the Mises Bookstore. My reading list was too long already and my bags were completely full after weeks of travelling and a year in Australia - and most books are available online anyway. Being at the Mises Institute however, in the presence of brilliant people, and encouraging scholars, surrounded by so much amazing reads, I evidently couldn't resist. Among the books I acquired, were Murphy's latest book Choice as well as his study-guide to Human Action. A story I have told some close friends (but still not published on Life of an Econ Student), is my introduction to Austrian Economics, and my spectacularly failed attempt of reading Mises' great treatise on my own. Since then, I have been mortally afraid of the 900-page book, and learned what little I know through other sources. My experiences this year finally convinced me that it's time to try again, three years after my first attempt. The warm-up was reading Murphy's Choice. And honestly, I found it was pretty dull. these last few years learning a lot of econ and familiarized myself with many schools of thought via university lectures (but more often student associations or reading groups or Mises University), I know much more econ than I did back then. 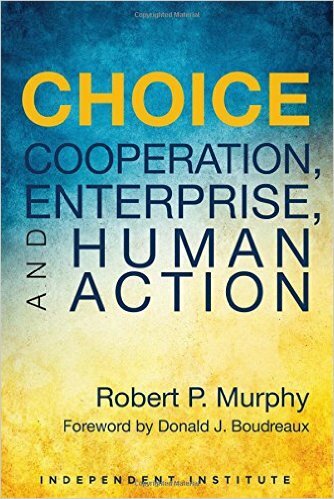 Consequently, Murphy's excellent and easy-flowing prose, his solid arguments and illustrating examples are somewhat lost on me. Like in Chapter 11 ('Indirect Exchange And Money'); from simply reading the title, I knew he would begin with Menger's tracing of the origin of money, describe the chartalist critiques (predominantly Knapp), commenting on the more modern attack by anthropologists such as Graeber, continue with the equation of exchange, the regression theorem (maybe bitcoin) and probably the disputes surrounding the Gold Standard. As expected, the next forty pages were a solid description of all those topics. And revisiting them was certainly fine, but hardly exciting or adding anything I didn't know already. The next chapter on money & banking was slightly better mostly because I found references to Selgin's great research into 18th century private minting (a review I still haven't published, despite finishing the book back in February), and had Mises confusing treatments of different kinds of money (Commodity, Credit, Fiat, Token, Ceritficates, Substitutes etc) thoroughly explained. Likewise, the chapters on the Socialist Calculation Debate and the ABCT were kind of boring and superficial, especially for someone who has done some research into them. 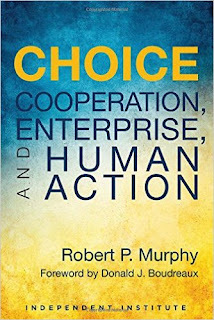 In an excellent and typically Murphy-like way, he deciphers Mises' meaning and explains its purpose. A mechanism by which interventionist policies hamper the economy (such as the regulatory burden) is by adding useless costs to production. Such measures are punished by the inflow of cheaper products from abroad, since foreign competitors normally aren't limited by such regulation. By introducing protectionist measures, the inflow of cheaper products is prevented, and the relative impoverishment (compared to what would have been) following from the government interventions are hidden away in higher costs - or spread out and transferred to other sectors of the economy. Therefore, Mises claims the "main function of tariffs" isn't always the Donald Trump-like "Keep American Jobs at Home", but to cover up and distribute the cost of other interventions throughout the economy. Absolutely brilliant analysis. Even though I yawned through much of Murphy's book, I must admit that it's a perfect introduction to Austrian Economics. Exactly the kind of introduction I would have wanted, and exactly the kind of introduction I would recommend anybody starting out today.